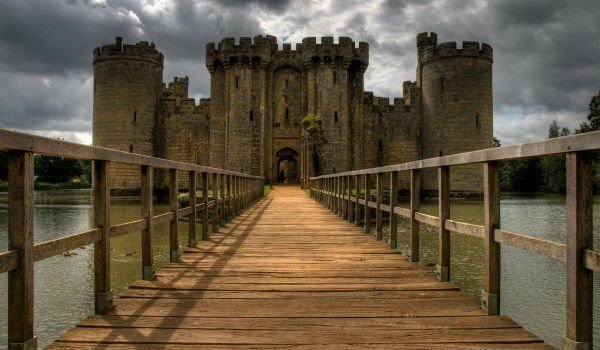 Bodiam Castle is located off the Celtic Sea, in southern England. It is one of the most beautiful and best preserved castles in that part of the country. 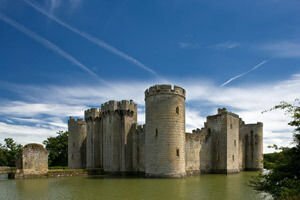 Bodiam Castle is in fact a square fortress, which overlooks the beautiful and scenic plane of County East Sussex, near Robertsbridge. From there the British capital London is situated 100 km in a south easterly direction. Bodiam Castle was built in 1385 during the 100 year war on the orders of King Richard II. The motive for the building was to defend the British territories of French attacks. Around the whole palace a moat filled with water reaching up to 200 m in width was built. The only way to move through it is via the bridge that leads to the main gate of the fortress. Initially, for better protection, there were wooden bridges on each side of the tiny island. Now there are only the bridge piers. Immediately after the island just before the gates of the castle there are ruins of a small defensive structure Barbikon, standard for most English castles. Until 1917, when Marquis Carson acquired rights over the property and became involved in its recovery and rejuvenation, the castle was abandoned and was in fact half destroyed. After his death in 1925 Bodiam Castle was transferred under state custody. The structure of architecture of Bodiam Castle is really amazing. The interior is absolute contrast with the facade, as inside the premises are almost entirely destroyed. Before the palace there is a lake that is covered with beautiful passages of water lilies. Castle Bodiam contains about 33 fireplaces, 10 staircases and spirals of at least 28 channels for outgoing people. So the architect of the castle fulfilled as a well protected fortress, providing comfortable conditions of life of its inhabitants.